All of these hikes are suitable for young children, although they are not stroller-friendly. It is always a good idea to bring water, snacks and/or lunch, sunscreen, bug repellent, raingear (just in case), and BOOTS in the springtime, comfortable walking shoes year-round. Sandy trails and little hills are fun for kids. Take Washington Ave. Extension west to Rte. 155 in Albany. Turn right onto 155 North. The NEW parking lot is at the new Pine Bush Discovery Center – a brick building on the right. The trail begins behind the building, but plan on staying to visit the turtle and see the exhibits in the Discovery Center after the hike. This is a dramatic place, with a trail that leads through split rocks, down a small ravine, and along a stream to a picnic spot below a 30-foot waterfall. Bring clothes that can get wet and a picnic lunch. Take Rte 20 west from Albany. About 6 miles after the railroad underpass beyond Guilderland, or 2 miles after the Schenectady County line, turn left on Schoharie Turnpike. You will pass Jewett’s Poultry Farm about 0.5 miles before the turn. After turning onto Schoharie Turnpike, continue on – in 3 miles you will cross railroad tracks. About 0.3 miles after the railroad crossing, park in the designated area on your left. A wonderful kid’s place with a pond, geese, streams and more. This can be a muddy place, so dress accordingly. One year there was a mama goose sitting on her eggs. From Albany, take Delaware Ave. through Delmar. Two and one-half miles from the Four Corners turn right on Orchard St. and then left onto Game Farm Rd. (Both turns are well marked.) Meet in the middle part of the parking lot. To reach Delmar from points southeast, you can take the Berkshire Spur (I-90) over the Hudson to Rte. I-87, and then 87 N to the Delmar exit. Follow Rte 9W S to Rte 32. Follow 32 around Delmar to a right on Rte 52 (a little over three miles). Follow 52 about 1 mile to Delaware Ave., take a left and look for Orchard St. on the right. This one’s suggested in The Daily Gazette as an extra-easy hike. Wikipedia’s got some background info. as well. It’s wetlands with a boardwalk for portions of the trail. This trail boasts a nice view of a waterfall, and it’s not too long a hike. From Albany, take 9W south to Ravena. Turn left at the big intersection onto Route 143. In Coeymans, turn right onto 144. The preserve is about .8 miles on the right. From the east, take the Berkshire Spur to I-87 N, exit exiting at Selkirk. Take 144 south through Coeymans, preserve is on right .8 miles past Rte. 143. The Audubon Society’s NY headquarters is here, and along with a butterfly garden, this preserve has level, easy trails, wonderful wildflowers and a picturesque stream. Sometimes we end up wading, so bring a change of clothes and boots or sneakers that can get wet. From Albany, take Rte 32 S to the Village of Feura Bush. Turn left (south) on Rte 102 for three miles, take a right on Rarick Rd., and go 2/10 mile. Park on the left. From Columbia/Rensselear Counties, take the Berkshire Spur to I-87 N, exiting at Selkirk. Take a right onto Rte 144 S, another right onto Rte 396 W, and stay on it, crossing over Rte 9W. Proceed to a right on Rte 102 N. Rarick Rd. should be only a short way N on the left. Proceed as above. A reader reports that this is a good one, with some steep parts, but plenty of water to play in. Designated “the best in our area” by a retired state botanist, this woodland is rich in lime-loving wildflowers and ferns and even boasts a playground! Sort of like Jurassic Park without the dinosaurs, it has interesting rock ‘stacks’ on either side of the trail. Take Rte 9W south from Albany to the intersection with Rte 143 in Ravena. Turn right (west) on Rte 143 and go approximately 2.5 miles to Rte 102. Turn right (north) onto Rte 102 and go ½ mile to the Park, which is on both sides of the road. There are two parking areas, a semi-circle driveway where the trail will start, and just down the road, a parking lot by the tennis courts where the trail will end. If you park at the tennis courts, walk up the road to the starting point (facing the tennis courts, turn left). From points SE, take the Berkshire Spur (I-90) over the Hudson to Rte I-87 N. Take the first exit at Selkirk. Take a right onto Rte 144 S and proceed a short distance to a right onto Rte 396 W, which will take you to 9W S. Take a left on 9W and proceed to Rte 143 as above. The limestone plateau has been eroded into tiny ravines filled with moss and ferns. If we hit it just right, the forest floor will be carpeted with white trillium. Take Rtes 20 and 146 to Altamont. In Altamont, turn right, staying on Rte 146. Continue on 146 for 5.5 miles, crossing County 252 at 5 miles, and turn right onto Nash Rd. at 5.5 miles. The trail entrance is on the left, just 0.1 miles from the turn. Park along Nash Rd, but please don’t block the farm gate on the right. Easy hike, 2 miles round trip, a lovely little creek. Off Rosendale Road. I don’t know how I managed to forget about this one, but luckily The Daily Gazette reminded me. There’s a parking area at the end of Whitmyer Drive off River Road according to The Daily Gazette. Nice views of the river. This trail follows the shoreline of Peebles Island, which sits at the junction of the Hudson and Mohawk Rivers. There’s a nice picnic area at the beginning of the trail and a picnic table stop on the trail with a view of a waterfall. Take I-787 north to where it becomes a smaller road with stoplights. About 2 miles past the Route 7 split, turn right (East) onto Rte. 470. Continue for more than half a mile, just before crossing a bridge over the Hudson; turn left (north) onto Delaware Ave. Continue to State Park entrance. The trail is at the far left end of the parking lot. A recommended hike with water to play in. See link for details. This is a beautiful site with woods, a stream and an open meadow for picnics. From Albany, take I-90 east to exit 12 — Rte 9. Go south on Rte. 9 for 1.0 mile to an awkward left onto Rte 32 toward North Chatham. There’s a large red antique barn called Ragtime on the right just before the turn. At North Chatham, turn right on Rte 203 to the end of the village. Take the first left onto county Rte 17. Stay on 17 about 3 miles, just past where Rte 66 merges in from the left. Just after 66 crosses a bridge into Chatham Center, take a hard left onto Rte 13. Stay on 13 approximately 2 miles, past signs for the Shaker Museum to the left. Just beyond, turn RIGHT onto Pitt Hall Rd. Pass the Quaker retreat center on the right (a lovely place). As you go up hill, bear LEFT at a fork. In less than ¼ mile, look for the Sanctuary parking lot entrance on the right. Side trip note: Just a short drive from the sanctuary is the Old Chatham Sheepherding Company, a working farm where visitors are welcome. You might be see fun stuff like baby lambs and lots of tractors. Bring some money for just-made cheese and yogurt. A reader reports that this is a good and fairly level walk, and it has some ravines and streams, which always make a hike more fun. This is a lovely new nature center with trails along a lake, through fields and woodlands. There is a beaver lodge, and good wildflowers in spring. The Center itself boasts live reptiles, busy bird feeders, and lots of “hands on” nature for young ones to explore. Take Rte. 85 west to Rte. 157 towards Thatcher Park. Follow Rte. 157 directly through Thatcher Park (watch your speed as you enter the park, the speed limit is strictly enforced), and take the first right after the Park onto Ketchum Rd. The Center is 0.8 miles on the left. Located 15 miles west of Albany on Rte.157. From I-90, take Exit 4, Rte. 85 West to Rte. 157 and take a right. Watch your speed as you enter the park, the speed limit is strictly enforced. Try parking in the Hop Field parking area , the first picnic area on the left, and hike the Hop Field loop. A portion of the Albany Pine Bush found in Schenectady. Featured as an easy flat hike in The Daily Gazette. Bartholomew’s Cobble, Sheffield, MA. This is a beautiful place with great trails and lots of spring wildflowers. You can wander through open fields with wildflowers, through thick forest, scramble over rocks, hike along the Housatonic River, and make your way up to an overview with a great view. A fee is charged. There are several ways to get there from here, depending on your starting point, but get to Rt. 7 in western Mass. From Rt. 7 south in Sheffield, turn right onto Rt. 7A and follow for 0.5 mi. Turn right onto Rannapo Rd. and follow for 1.5 mi. Turn right onto Weatogue Rd. to entrance and parking on left. Dyken Pond Environmental Education Center, Poestenkill. This is a lovely spot with an “Adirondack” feel. One trail boasts a short boardwalk over a real sphagnum bog, with many interesting plants, including the carnivorous pitcher plant (“little shop, little shop of Horrors”). Some people wade in the lake. From the intersection of Rtes 150 and 43 in West Sand Lake, take Rte 43 E a short distance to Rte 351 N on the left. Take 351 to the four corner intersection (four stop signs) in Poestenkill. Take a right onto Rte 40, climbing the hill to just past the Barberville Falls. Take a left onto Rte 79N (Blue Factory Rd. 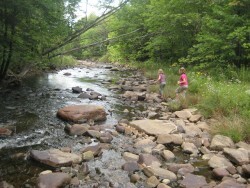 ), crossing the Poestenkill on a small bridge. Take 79 approximately 4 miles to Rte 80, which is also Madonna Lake Rd. Follow Madonna Lake Rd. approximately 2 miles, until it bears sharply left and Dyken Pond Rd. proceeds directly ahead. Take this dirt road approximately 2 miles to the Center. Park on the right. Greenport Conservation Area, Hudson. The area has great views of the Catskills and lots of cool places to stop for a break, including a gazebo. From Albany, take I-90 East to Exit 12. Turn right on Rte. 9 south and drive 16.3 miles to Greenport. You’ll drive through Kinderhook along the way. Turn right onto Jolsen Blvd. (just past a Mobil Station) and drive 1.2 miles. At the Jolsen Motor Lodge, turn right onto Daisy Hill Road and follow to the end. Ram’s Horn Livingston Audobon Sanctuary, Catskill. This trail goes through an overgrown orchard to a tidal marsh with bridges and a viewing tower. Take I-87 South to exit 21, Catskill. Go left onto Rte. 23B, straight to 9W, then right onto 9W south into Catskill. Turn Left onto Grandview Ave, stay straight on Grandview through the traffic circle, down the hill to sanctuary parking lot. Papscanee Island Preserve, Rensselaer. This preserve is right on the Hudson River. If the tides are right, we can walk down the beach and watch boats go in and out of the port. From Rtes. 9 and 20 south and east in Rensselaer, bear right onto Rte. 9J south towards Castleton. After about 4 miles, turn right onto Staats Island Road, cross the railroad tracks, and the preserve is on the right. From the south, the preserve is 2-3 miles north of Castleton. Sam’s Point Preserve, Shawangunk Mountains. This Nature Conservancy preserve is incredible. A scenic walk along an old ridge road brings you to the “Ice Caves” – a rock formation more reminiscent of the American Southwest than the Northeast. The narrow trail meandering through deep ravines and under arches will enthrall your kids and you! We will eat lunch on the trail. Take I-87 south to Kingston or New Paltz. From Kingston, take Rte. 209 south to Ellenville. In Ellenville, take Rte. 52 up the side of the mountain to the summit. At the top, take a left, following signs for the hamlet of Cragsmoor. Keep left past the library and post office. Approximately 0.1 mile past the post office, take a right onto Sam’s Point Road. Follow this 0.5 mile to the preserve gate and parking area. Most of this list was compiled by a local group that hikes with young children in the spring and fall. In the past, they would hike on Thursday mornings. The former organizers have moved on, but if anyone is continuing these hikes and would like me to share their contact info and/or a website, please let me know. I’ve added a couple of extra hikes as I’ve come across them. Here’s an article on Schenectady hikes from The Daily Gazette. If you have more suggestions, please let me know at capitaldistrictfunblog [at] gmail[dot] com. And if you need a little outdoor inspiration, check out local outdoorsy bloggers Saratoga Woods and Waterways, the TU’s Outdoors blog, and No Rocking Chair for Me.